Oct. 28, 2010 –Brazilian show jumping superstar Rodrigo Pessoa blazed to wins in Thursday’s open jumper classes. Dressed as a Formula One race car driver, he and Palouchin de Ligny won the $20,000 Gambler's Choice Costume Class, and earlier, with HH Ashley, he won the $30,000 class. Plus Kristin Glover and Chase Boggio winners. The Gambler's Choice Costume Class sponsored by Louisburg Farm and Beth Johnson was a treat for the crowd as riders dressed as various characters competed over a course where each jump carried points, and each jump cleared added to the rider's points. Hillary Dobbs, Sussex, NJ, rode Marengo, owned by The Dobbs Group, to second place. Irish rider Shane Sweetnam and Spy Coast Farm's Allisson were third. Pessoa enjoyed the costume class and a great addition to the WIHS schedule. “It's fun and it's important for the crowd. Tonight they had a nice turn-out with all the kids that are here. They saw a traditional class and it was a little bit more fun for them. It's important to give back to them as well. Without the fans, the sport would not be much,” he said. 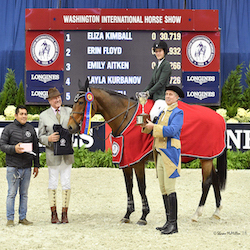 Pessoa won the Crown Royal Trophy donated by Crown Royal as the winning rider, and Palouchin de Ligny, owned by Pessoa Stables, was presented with the Sue Ann Geisler Memorial Trophy donated by the Washington International Horse Show. Pessoa and HH Ashley, owned by Double H Farm, competed in the second half of the class held during the evening session. They were one of six clear rounds to advance to the jump-off. 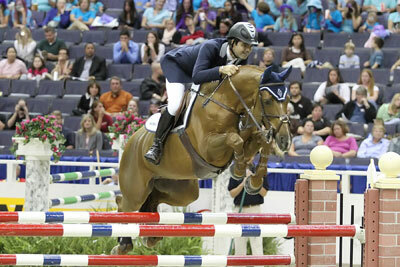 Pessoa and HH Ashley set the “Travelers Time to Beat” with no faults in a time of 31.88 seconds. Kent Farrington, Chicago, IL, rode Top Gun for Iron Horse Farm to second place in 32.58 seconds, while Margie Engle, Wellington, FL, and Gladewinds Farm's Indigo finished third with four faults in 33.22 seconds. Pessoa and HH Ashley have a new relationship, having only been together since May, but they have been successful. They won the World Cup qualifier grand prix in Harrisburg just last week. “I have been taking her along quite slow. She’s getting better every time now. It was time to start pushing her a little bit and start doing some bigger courses. She’s been really serious the last two weeks,” Pessoa noted. Kristin Glover and The Boy Wonder were the only clear trip in a time of 64.873 seconds in today's $2,500 Amateur-Owner Jumper Time First Jump-off class. In second place as the fastest four-faulter was Tracey Weinberg on Larone, who finished in 63.785 seconds. Jean Sheptoff and Peaches were third with five faults in a first round time of 69.680 seconds. Glover, who is from Richmond, VA, has owned The Boy Wonder, a 14-year-old Appendix Quarter Horse, for three years. “It has just been a blast,” she said of their partnership. This is the first time that Glover has shown at the WIHS. “This was a nice way to start and I really like the ring. This is something that I have always wanted to do. I stopped riding for a long time and got back into it about six years ago. It has just been a lot of fun and it has gone great,” she remarked. For her win tonight, Glover was presented with the “Footloose” Perpetual Trophy in remembrance of Ruth Ellen Wilmot, donated by The Curtin Family, in honor of the 1990 winner “Footloose,” ridden by Caroline Curtin. In the $2,500 Junior Jumper Time First Jump-off class sponsored by AAA Equestrian LLC, a similar situation took place. Chase Boggio of Canton, GA, and his horse Hennessey were the only clear round (64.106 seconds) in the class to take the blue ribbon. Hasbrouck Donovan and Delilah were just off the pace in the first round in a time of 69.046 seconds, which gave them one time fault. The fastest four-faulter was Karen Polle on What Ever in 62.897 seconds for third place. The pair have won two other classes together in their short time together, but this is Boggio's first win in the jumpers at the WIHS. “It feels good because I don't get a lot of ring time in the jumpers. It's just nice and reassuring that my hard work in the jumpers pays off too,” he said with a smile. Boggio was presented with the Beagle Brook Farm Perpetual Trophy donated by Beagle Brook Farm.